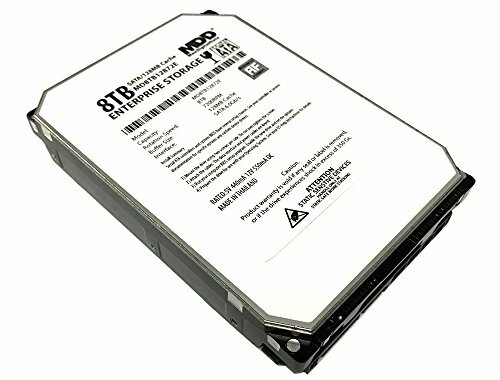 MaxDigitalData (MD8TB12872E) 8TB 128MB Cache 7200RPM 3.5″ Enterprise Hard Drive delivers the world’s first hermetically sealed, helium hard drive, the MD8TB12872E 8TB HDD massive scale-out envi- ronments. Why does helium make a difference? Helium has only one-seventh the density of air. Replacing air with helium inside a hard drive dramatically reduces the turbulence caused by the spinning disks, cuts power consumption and results in a lower temperature within the disk drive. The reduction in turbulence for the spinning disk allows HDD to deliver a seven-disk design in a traditional 3.5-inch form factor. In addition to being the world’s first helium-filled hard drive, This design provides a 50% capacity gain and still reduces the energy needed to run the drive by up to 23%. The amount of data that companies need to store is growing exponentially, but IT budgets remain flat. With 8TB, a low 5.3 idle watts, a reduced weight of 640g, and running at 4-5°C cooler, the new HDD lowers data center total cost of ownership (TCO) on virtually every level. Passed Factory Diagnostic Software + State-of-the-Art software Full “Sector-by-Sector” test to ensure best HDD quality! ZERO Bad Sectors!